The plaque commemorates the 50th anniversary of the meeting to establish a co-operative milk factory by farmers and soldier settlers in 1949. 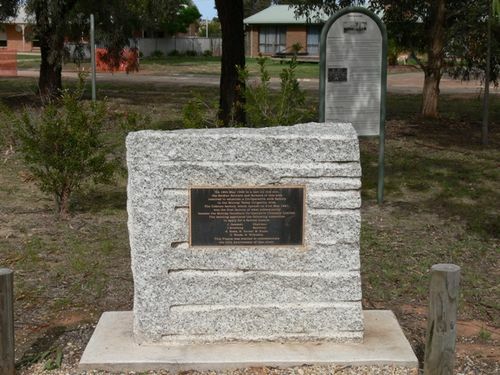 On 18th May 1949 in a hall on this site, the Soldier Settlers and farmers of this area resolved to establish a Co-Operative milk factory in the Murray Valley Irrigation Area. The Cobram factory, which opened on 21st May 1951, was the first factory of what subsequently became the Murray Goulburn Co-Operative Company Limited. The meeting appointed the following committee to apply for a factory licence. This plaque was erected to commemorate the 50th anniversary of that event.